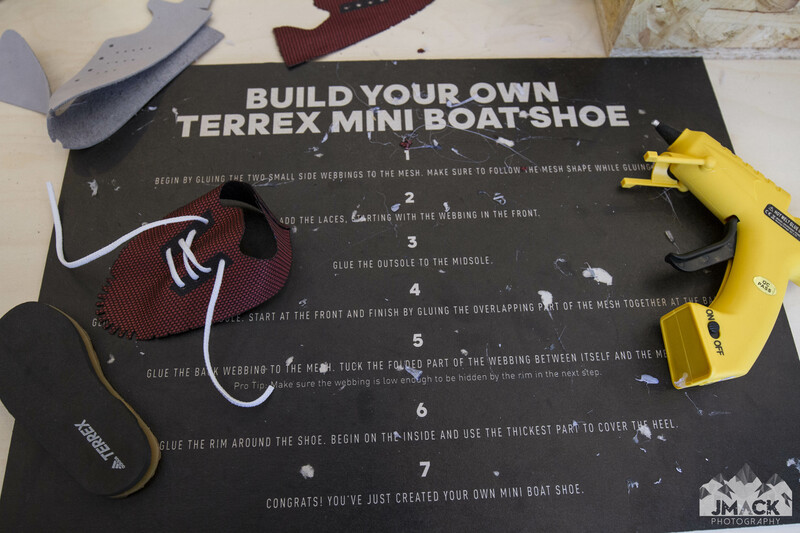 adidas TERREX took over Kendal Mountain Festival’s Advanced Basecamp for 2018, providing a greater area to exhibit and with that, new opportunities to engage with the public. Looking over the main basecamp, the marquee had room for their latest Climaheat Jacket and Fast shoes (both in for review), a long with their new Agravic XT shoes. For those looking to engage, there was a demo fleet of shoes to try out and this was for my eyes, the most interactive element of the festival, as it allowed you to do something you wouldn’t be able to do outside of a shop demo night – and we all know how scarce they can be unless you live in specific areas of the country. However, I am not here to talk product. What, no new product to drool over?! With detailed shots in my local woods and tails from the trail. No. This time I made a shoe myself. adidas TERREX may not be the brand you immediately associate with trail running, but their heritage in performance footwear is recognised globally. Their road shoes are second to none, having propelled elites to victories at all distances on road, track and field, as well as football, rugby, baseball, basketball…. the list goes on. In recent years, Adidas has been overhauling the adidas TERREX brand, their specific outdoor division, which includes elite athletes such as Luis Alberto Hernando (2016-2018 IAU Trail World Champion), Shauna Coxsey 2 times IFSC Bouldering World Cup overall winner, Freeride MTB star Martin Söderström and a host of others. The more I have used adidas TERREX products you realise they are a more than just viable option, they are a competitive alternative, the clothes utilise similar, if not the same materials as their more readily available competitors, however, their design team often include little design touches others don’t. If you get the opportunity to try their products, I think you will be impressed. But, I said I wasn’t here to talk product (you’ll have to wait a few months for that). At the end of Advanced Basecamp was AT’s Here to Create lab. Was it a lab? Who knows. Anyway, it gave the opportunity to create your own shoe. Ok, it wasn’t life size, but it had the fundamental parts used in the construction. Outsole, midsole, fabric body, rand, laces etc. You had the option to go plain and simple to full designer, heck you could hipsterise if your heart desired. Me being me, I kept things very much to the letter, following the example and skipping the rand at the end. Nature was the largest battle, with the crisp Kendal air setting the hot adhesive, ejected by the glue guns immediately. Outside of giving an insight into some of the process in creating a shoe, it gave time to speak to members of the adidas and All Condition Media Team, as well as other members of the pubic. “What design are you going for?” “how do you do this bit” and laughing at our inability to do something so straight forward brought people together. Below are some of the shots of creating the shoe. This was by far the most enjoyable experience I had outside of the sessions, the 10km though awesome was a lung buster, and shows there is far more to Kendal Mountain Festival then films. I think it’s safe to say, I should not take up work as a cobbler or on a production line anytime soon…. Stay tuned for tests and reviews of adidas TERREX winter products in the coming months.